In this post, we’ll recap last week’s survivor carnage, then analyze the pros and cons of NFL Week 2’s most popular survivor picks: the Rams, Chargers, Saints, Redskins and 49ers. As New Orleans demonstrated last week, the “safest” NFL survivor pick isn’t always the best option. To maximize your edge in survivor pools, you need to consider two other critical strategy factors: pick popularity and future value. For a quick primer on winning survivor pool strategy, see our post on how to win more NFL survivor pools. Want expert Week 2 picks for your NFL Survivor Pool? Last season, TeamRankings subscribers reported over $1 million in NFL survivor pool prize winnings. Check out our NFL Survivor Picks product. Talk about starting out NFL survivor season with a bang. The New Orleans Saints, the most popular survivor pick of Week 1 by a decent margin at 30% pick popularity, promptly lost on Sunday. The Detroit Lions, the fourth most popular pick at 10% popularity, followed on Monday night. Add in a smattering of survivor picks on losers including the Chargers, Colts, Cardinals, Titans, and Falcons — plus the Pittsburgh-Cleveland tie (since many survivor pools treat ties as losses) — and in total more than half of the public was eliminated from survivor pools in Week 1. That’s the highest percentage of Week 1 survivor eliminations since SurvivorGrid started publishing elimination data in 2010. So if you’re still alive, congratulations. Your odds to win your NFL survivor pool this year should be around double what they were before last week’s games started. On balance, last week was also a very good one for subscribers to our customized NFL survivor pick advice. Our analysis showed that New Orleans was not the best pick for most types of pools, and we primarily recommended the Saints only for multiple-entry “portfolios” of picks. Overall, about 9% of our subscriber pick recommendations were on the Saints, compared to a public pick rate of 30%. In addition, we didn’t recommend Pittsburgh to any subscribers, and only 8% of our recommended picks were on the Lions (vs. 10% for the public). About 80% of our subscriber pick recommendations last week were either the Packers, Ravens, or LA Rams. We definitely caught some luck with Green Bay’s second half comeback against Chicago, but in the end all three of those picks were winners. When the dust settled, 83% of TeamRankings pick recommendations won last week, while only 48% of the public’s survivor entries survived. Now let’s get to some Week 2 survivor pick analysis. Here are some important details you need to consider about the five most popular survivor picks this week. Note: Data referenced below was current as of Wednesday afternoon, and could change between posting time and kickoff time; our NFL Survivor Pool Picks update multiple times per day with the latest information. Also, we estimate survivor pick popularity based on picking trends data from popular survivor pool hosting sites. After pulling away from the Raiders in the second half and easily covering a 6.5-point spread on Monday Night Football, the Rams are favored by a whopping 13 points at home against an Arizona team that was upset by Washington last week. That’s the largest spread of the week by a full three points, compared to the Saints at -10. As a result, there is a significant safety cushion in choosing the Rams if those lines hold up — though it’s worth noting that a big second half in a prime-time Monday Night game plus some luck (LAR won the turnover battle 3-0 against Oakland) may be inflating the market’s opinion of the Rams at least somewhat. At 36% popularity, the Rams may seem over-picked; it can often be beneficial to avoid picking teams that are this popular. However, that popularity level is actually not that crazy given LAR’s relative safety compared to the alternatives this week. It’s future value that is the main concern if you burn the Rams now. That’s especially true in bigger pools, as LAR has a string of 60%+ probability wins in the second half of the season. It’s a 1-2 sweep for the LA teams in Week 2 in terms of survivor pick popularity — kind of remarkable for a city that didn’t even have an NFL team a couple years ago. It’s also relatively rare to see an 0-1 road team, especially this early in the year, accumulating such a high percentage of the public’s picks (23%). Perhaps it’s understandable, given the utterly pathetic performance of the Bills last week in their 47-3 shellacking by Baltimore. Can Buffalo really be that bad longer term? It’s possible, but not very probable, which is reflected in the fact that LAC is a 7.5-point favorite in this game. That’s a steep drop in safety from the Rams, even though it still makes the Chargers the third-safest pick of the week. If you can get on board with the added risk, however, you’re not burning a ton of future value if you pick the Chargers, which is good. Although Week 5 (home vs. Oakland) looks like a decent spot for LAC, there should be several viable alternative picks that week, and the next good matchup may not come until Week 11 or 12. Yes, the Saints suffered an embarrassing home upset last week at the hands of 10-point underdog Tampa Bay. And the Browns, coming off a 21-21 OT tie against one of the expected top teams in the NFL, are likely better than most people think this year. But it’s typically wise not to overreact too much to Week 1 results, and don’t forget that the Steelers had an unlucky six turnovers against Cleveland. New Orleans is a 10-point Vegas favorite in this game, making the Saints the second safest pick of the week. Despite that level of safety, the Saints’ pick popularity (21%) is still a hair lower than the Chargers, perhaps in part because players who didn’t use New Orleans last week — and didn’t get eliminated as a result — are scared to use them. That fear could be warranted, as our power rating for the Saints did drop after last week’s result. Interestingly, though, if the Saints are indeed worse than previously thought, that may only increase the case for using them now, at home vs. Cleveland, instead of saving them for later. So “personal fear of using New Orleans after what happened last week” may be the your biggest decision factor here. The three teams listed previously (Rams, Chargers, Saints) are head and shoulders above any other Week 2 survivor picks in terms of popularity, collectively absorbing almost 80% of the public’s picks. After New Orleans, it’s a big drop down to the next most popular team, Washington, which is 5% picked. It appears that safety, unsurprisingly, is the primary reason. The Rams, Chargers, and Saints are the only teams favored by at least a touchdown in Week 2, followed by a cluster of a 4- to 6-point favorites that includes the Redskins at -5.5. Washington turned some heads after its surprise road upset against Arizona, a team expected to improve this year, while the Colts were upset by Cincinnati. So recency bias could be what’s making the Redskins the most popular pick out of this second tier of teams. On the plus side, with no projected future games with over 70% win odds, Washington’s future value is not very high. Going contrarian and picking them primarily means making a relatively big gamble in terms of elimination risk, especially when a significant number of your opponents will be on two very high probability winners this week (the Rams and Saints). The 49ers have a very similar survivor pick profile as Washington, but based on Vegas odds and our projections San Francisco is slightly more likely to win, and slightly less popular of a pick. So if you’re considering Washington, you should consider the 49ers instead. They offer similar risk for a slightly better potential reward. Which Team Should You Pick In Survivor Week 2? Your best NFL Week 2 survivor pick is the one that offers the ideal balance of safety, pick popularity, and future value for your specific pool. Every possible pick has an expected value associated with it, and it takes a lot of data and math to figure out which pick will maximize your expected profits from your survivor pool. Why? 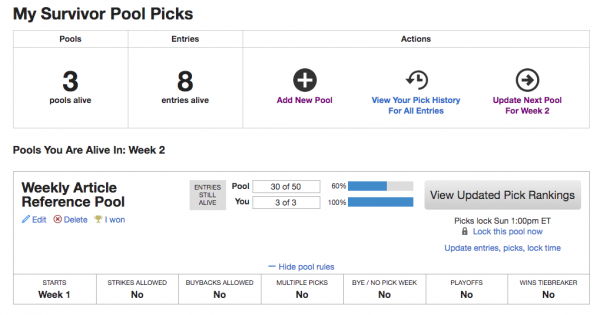 Because factors like the size of your pool and its specific rules can make a big impact on your optimal Week 2 pick strategy. For example, the more entries your pool has, the more aggressive your picks need to be. In very large pools, you know going in that you’ll probably need to survive all 17 weeks to have any shot at prize money, so if there’s a very good option to pick a mediocre team early on, you should take it. In smaller pools, you should play it safer, but you also need to consider what percentage of your opponents have been eliminated so far. We built our Survivor Picks tools to do all of this analytical work for you. You answer a few questions about your survivor pool’s size and rules, and we provide customized pick recommendations based on the latest matchup data, Vegas odds and public picking trends. Survivor pools are incredibly risky games, and it’s never easy to win. Even with the edge our advice gives you, in most years you won’t take home the prize. But in the long term, our subscribers are winning football pools around 2-3 times as often as expected, and that performance typically translates into fantastic financial returns. We invite you learn more about our NFL picks and tools: NFL Survivor Picks, Football Pick’em Picks, and NFL Betting Picks.